Crescent History | Crescent Lawn History | Bath History | Literary Bath | Bath at War| What If? Ever since the Royal Crescent was built, the Lawn has been a privately maintained area, with residents’ rights of use. The Crescent Lawn Company (CLC) was formed in 2003 with the purpose of holding the title to the Lawn and its boundaries and managing their upkeep on behalf of the Society. Absolute Title was granted to the Company on 8th April 2003. Acquisition of the title does not affect residents’ rights to use the Lawn as enshrined in their Leases or Freeholds. The Royal Crescent Society has long championed the restoration of the Lawn's Railings and of the Ha-ha itself. The CLC initiated a project to achieve this and with Resident contributions, Royal Crescent Society funds and a Heritage Lottery Fund grant entered into partnership with Bath & North East Somerset Council (B&NES) to progress the work. The work on the restoration of the railings was completed in 2011 and the pavement in 2012. Below we have published an article "New Angle on Famous Crescent Vista" first produced in March 1957 in the Bath Weekly Chronicle, which covers another restoration project to change the "cabbage plot" to lawn. Royal Crescent is now back in the setting which it is loved by Bathonians and visitors to the city in fact, the setting has been improved to provide an entirely new vista. Almost a year has passed since the Parks Committee began "Operation Face-lift" the beauty treatment which saw the cabbage patch" - as it was often described during the years since the war disappear. .In its place has sprung up the rolling greensward which now provides the Crescent's "front place". The five acres of grassland which during the war and up to last year provided valuable food producing land, now merges into the Royal Victoria Park. The ha-ha, (boundary ditch) which separates the parkland from the Crescent front lawn has been retained. To open up the vista - it is indeed a magnificent view, both from the Crescent and the park ends- the hedge which ran parallel with the park pathway has been removed, the land in its immediate vicinity flattened out and grass seeded. The concrete stanchions and wire fencing on the other side of the pathway are also disappearing. Bathonians will recall that before the war cattle and sheep grazed on this parkland. This feature is not being re-introduced. The idea is that visitors to the park can enjoy this five-acre area. The Royal Crescent Field, to give it its full title, provided plots for 72 allotmenteers during the war. At the end of the war the "temporary" allotments remained and there was pressure from the genral public and from sections of the City Council, for the restoration of the green field. But it was not until 1956 when the Parks Committee assumed responsibility for the allotments in the city that it was possible to evolve the scheme which is now almost complete. The Committee were able to do so because it was possible to transfer the allotment holders from Royal Crescent to the Lower Common site and others in the city. During the years there were many critical comments about the retention of the field as a "cabbage plot" but the former Small-holdings and Allotments Committee fought hard and successfully to retain the site until it was satisfied that satisfactory alternatives were available. The total cost of the restoration of the front approaches of the Crescent to its former glory is in the region of £200. The first question anyone asks about a Ha‑Ha is where on earth the name comes from. In 1770 the 'arbiter elegantarium', Horace Walpole described the clearing away of boundary walls and the digging of ditches in the early part of that century as 'an attempt they deemed so astonishing that the common people called them Ha‑Ha's! to express their surprise at finding a sudden unperceived check to their walk'. This does seem a somewhat dubious explanation ‑ and unfortunately Walpole does not go on to say whether these Ha‑Has ever worked as a sudden and unperceived check to gangs of football players. He was certainly right in calling the invention of the Ha‑Ha it was derived from French military fortifications ‑ "the leading step for all that followed". It enabled the great landscape gardeners of the time, such as William Kent, to open up sweeping views and at the same time to keep the Picturesque sheep and deer on the other side of an indivisible boundary. The Royal Crescent has a perhaps unique example of an urban Ha‑11a as John Wood the Younger used the device to blend the lawn with the countryside in the view from the windows. To re‑create the original effect of 'rus in urbe' there would have to be lambs gambolling in Victoria Park rather than language students, as is still the case below Lansdown Crescent. The Ha‑Ha Committee has been formed from Michael Daw, Jenny Hardisty and myself in order to restore it to its original character and appearance. The wall has lost many of its stones and has been re‑pointed with cement mortar; over the years the ditch has filled up with accumulated debris. The Ha‑Ha is a historic feature of great interest that now is neither effective nor attractive and with our sorely stretched funds we shall do our best to make it so. Horses were once kept in their place by the Ha‑Ha ‑ detail from an engraving of the early 1800s. My previous articles (see Issues 51 and 52) concerned the Lawn, the Ha-ha and the "paddock" beyond the ha‑ha. Finally, I propose to tell you a little of the history of the railings themselves. As in my previous articles, the information is gleaned from the records of the "Committee for the Improvement of the Royal Crescent" set up in 1825 by six residents of the Crescent. As we know from the sample Indenture of Release dated 20 December 1766, it was incumbent on each owner of the 30 houses which comprise the Royal Crescent , to create "iron rails or pallisadoes" to enclose the Lawn. However, by 1836 these original railings were in such a bad state of repair that it was deemed necessary to replace them altogether. The firm of Edward Lye and Sons were contracted to supply and erect wrought iron railings to run from Brock Street to Marlborough Buildings. The specification also included the erection of 155 yards of the original railings across the top of the Ha-ha. Indeed J. Newman's lithograph dated 1850 shows such railings across the top of the Ha-ha. It is not possible to say when they were removed; probably during one of the 3 periods when our records are missing, as there no further mention of them. Their removal must have improved the appearance of the Lawn considerably as it was then once again possible to enjoy an uninterrupted view from the houses, across the Lawn to the paddock and the Royal Victoria Park beyond. Indeed the idea of an uninterrupted view fulfils the purpose of a Ha-ha to give a view from manicured Lawn to fields of pasture beyond. Unfortunately the provision of the new railings was by no means the end of the story They required painting regularly every three years. In 1843 they were painted green, in 1892 they were maroon and in 1896 a chocolate brown. These are the only years when the colour is specified in the records. Railings in Georgian times were often painted dark blue or dark green. I had understood that railings were nearly always painted black after the death of Queen Victoria, but 1 have recently been told that this is not necessarily so. Apart from regular painting, the gates, locks and stone bases frequently needed attention. In the years covered by our records (1825 to 1899 with 3 gaps of several years unaccounted for) the locks were dismantled and repaired 12 times and all were replaced in 1893. New or extra keys were provided 4 times. The stone bases were repaired twelve times, and the railings themselves repaired, renewed or 'set upright` eight times. Exactly what happened in 1871 that caused the need for the bases needing repairs and the railings setting upright, is not explained. It is a relatively frequent occurrence nowadays; bad driving of one type or another destroys the railings, but in the days of horse and carriage??? As you can imagine, maintenance of railings, stone bases, gates and locks, not to mention the continual repainting meant that there was a considerable demand on the financial resources available to. the Committee. No wonder the Treasurer made such careful records of the payment from each house each year. When our new railings are installed they will be painted black (in keeping with all the surrounding railings). Thankfully, with the improved paint formulas of this century, they will no longer need to be repainted every 3 years as in Victorian times. it is a regular feature of all the 'Crescents' and many of the 'Places' in Bath that the frontage overlooks a grassed area, which is a substitute for a front garden. In the case of the Royal Crescent this grassed area of Lawn extends towards The Royal Victoria Park. The Ha-ha was built to delineate between the private grassed area and the public park, thus providing an uninterrupted view. 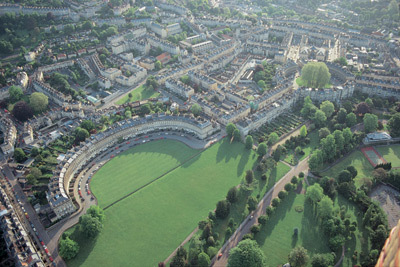 it is believed that the Royal Crescent Ha-ha is one of the very few urban Ha-has remaining in the country. The Ha-ha was built simply to separate the private Lawn from the public park and hence the wall acts merely as a facing wall rather than a revetment, and is not therefore required to hold back a great weight of soil. Archaeological investigations have shown that when first built, the centre of the ditch was about one metre deeper that at present, and much more of the wall was exposed. Unfortunately the bottom of the ditch was of clay and the accumulated rainwater was unable to drain away. This situation was plainly unacceptable and relatively soon after its formation the ditch was partially filled in. During investigations by Wessex Archaeology a few years ago late eighteenth and early nineteenth-century bottle-glass and pottery was found amongst the infill which bears out this theory and also helps to date the construction of the Ha-ha. The base of the wall exposed during the archaeological investigations showed it to be in sound condition as it has been protected in the intervening years by being buried. The top of the wall is not horizontal, as one might expect, but higher at the east and west ends than at the centre. 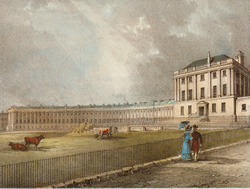 Exhaustive searches have been made to demonstrate whether or not the building of the Ha-ha is contemporary with the building of the Royal Crescent . No documentation has been discovered to confirm this belief and early lithographs and engravings have proved unreliable. For example Watt's engraving dated 1794 shows the Ha-ha in situ, but that of Nattes dated 1804 does not show it at all. However the late eighteenth-century glass and pottery found by the archaeologists amongst the infill in the bottom of the ditch indicate the approximate date. What is certain is that the area in front of the Crescent was designated for the enjoyment of the residents of the Royal Crescent and to improve the vista from the residences. In a sample Indenture of Release dated 20 December 1766 the new owner had to undertake that no buildings of any kind, nor plants, shrubs or trees of any kind were built or planted on the Lawn. 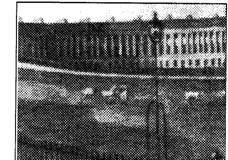 The new owner had to create 'iron rails or pallisadoes' to enclose the Lawn, and tanks under the Lawn to collect water for the use of the houses in the Royal Crescent . This being the case it is reasonable to suppose the delineation between the Lawn and Public Park had to be marked in some way if the Lawn was raised to accommodate the water storage tanks. How better to achieve this than to create a raised Lawn and Ha-ha? In the event the water storage tanks never were installed. 1897 extensive repairs were carried out viz replacing sixty-eight defective stones, rebuilding 300 feet of wall in different places, point the whole of 470 feet with coal ash mortar together with clearing out the ditch and levelling the sloping bank (all this at a cost of only £22.16s.0d). It is now well over two hundred years since the Ha-ha was built and we all know what a sad state it is now in. Roll on the day when work starts to restore the wall and redefine the ditch to a more acceptable state. The Royal Crescent Society is lucky enough to hold the records of the precursor of their Society. The records run, with three gaps of several years each, from 1825 to 1899. Originally six Gentlemen residents formed "A Committee for Improving the Royal Crescent". To support our application for permission to restore the Ha-ha and railings I have recently been delving Into the records and thought you may be interested to learn of some of the work and problems the original Committee dealt with over the years. There must have been some grumbling amongst the Residents about the inadequate street lighting because the first thing the Committee arranged was the purchase of ten extra "Bat's Wing" gas lamps and poles. These were placed between the existing lamps, and the Gas Company generally supplied two extra lamps free of charge, which were placed at each extremity. Each house paid £2.10s.0d per year for the gas and for the lamps to be painted and re-glazed as necessary. This charge stayed the same for 22 years, when it was argued the Gas Company was only maintaining their own lamps, and not the privately purchased ones, and the charge was reduced to £2.0s.Od per house. On 29th June 1854 a meeting of the Inhabitants of The Crescent was called to discuss the advisability of renting the field between the Royal Crescent Lawn and the Park. This field was called the Marlborough Buildings Paddock. This Idea was agreed to unanimously and arrangements were started to rent the Field from the owners, the Royal Victoria Park. It had been hoped the take over the Field at Michaelmas, but the tenant, Mrs Saltford declared that "she could not surrender possession without receiving compensation for the crop of grass for the remainder of the year". This was not forthcoming and so after a year's delay a formal Agreement was drawn up in 1855 between Mr. Keating of behalf of the residents of Royal Crescent and Jacob Smith acting for the Royal Victoria Park Committee. The Agreement ensured that the field would be kept as pasturage for sheep, and not altered in any way, was not mown more than once a year and the crop removed, with three loads of good rotten dung spread for every load of hay removed. The iron railings, fences and hedges maintained. No horses or horned cattle allowed. A rental of £20 per annum was to be paid. From the ensuing bills from then only I believe the east and west sides of the field were bounded by iron railings, and a hedge ran along the south side. The north side edged by the wall and Ha-ha. All went well, the rentals being paid regularly by the Committee. In the first two years no less than ten loads of rubbish were removed, and in 1872 ten loads of manure were spread. But in November 1876 Mr Ostler had to write on behalf of the Royal Victoria Park Committee to Mr Raymond Barker of 17 Royal Crescent (then the Hon. Sec. of the Committee) to draw attention to the dilapidated condition of the hedge of the Royal Crescent Field, requesting that he will "at his earliest convenience give the necessary instructions for planting and renewing the same." This letter had some effect and "young thorn” were planted. However the following February another letter arrived from Mr Ostler complaining of the dilapidated state of the hedge, and repeated in May, this time sternly reminding Mr Barker of the terms of the Agreement which. specified he kept the iron railings, hedge and fences in a satisfactory condition. So in May Jesse Hayward of 34 Belvedere charged £6 for altering and providing new rails and base bars, repairs to bases, straighten and repair several bars at the east end, and 3 new bars at the west end, and to repaint all the new work. In April 1884 Mr Henderson of 9 Royal Crescent wrote to Mr Stone, the new Hon. Sec., stating that he "had observed nine boys playing on the Lawn field. Something should be done to stop this." Sounds familiar? At some time the Field was sub‑let to William Cornish of 13 Cheap Street, as he wrote giving notice to quit the Field In March 1888. No doubt this prompted the meeting of the residents to discuss the desirability of continuing to rent the field. They agreed unanimously to continue for two reasons, firstly they could have some degree of control over it and secondly they made a small profit by its sub-letting, which defrayed cost of maintenance. In 1888 Mr George Pyatt, Dairyman and Farmer, of Bath Park Farm Dairy in the Royal Victoria Park saying that he had heard that Mr Cornish was giving up the field and saying that he would like to rent it. A letter arrived from Thomas Hays of 8 Marlborough Buildings in which he complained about the neglected state of the field, particularly about the "nettles which were spreading over the pasture adjoining the quick". Also a pair of oak posts and repairs to the iron gate cost £3.12.0, on top of more repairs to the railings. Luckily the Committee were able to have the rental reduced from £20 to £16 per annum, which would have helped balance the books. In 1890 advertisements went into several local papers and directories declaring "To be let from 25 March the Royal Crescent Field Apply Stone, King & Co, Solicitors, Bath ." George Pyatt was successful in renting the field, but in July 1893 he sent a letter to Mr Stone enclosing £9.0.0 for the March rental, "with thanks for kindly waiting his convenience. This has been a very expensive summer to all of the keepers of stock, and has kept me doing little else but paying for cattle foods"
In March 1897 a meeting of the Residents was called. The funds were £14 in debt as Mr Pyatt has not paid his rent for eighteen months. It was feared he was in an insolvent state and unable to pay his arrears. However, it was unanimously agreed not to give up the field but "to continue control over it and so prevent it being used for football or other undesirable purposes". (0h, if they could just see it now!) It was agreed that Mr Pyatt should be given notice to quit and another tenant sought. News about Mr Pyatt's financial difficulties travelled to Frank Shackell, of 6 Margaret Buildings who wrote to the effect that he had heard that the field probably be let, and would be glad to learn of the terms. But in September a new tenant was decided on ‑ Mr Alexander Wyatt of 3 St James Street, St James Square , Butcher. An Agreement was drawn up whereby he was to keep all fences, walls and gates in good repair, not to plough, mow more than once a year, not to stack hay or fodder, to manure, cut out weeds, remove molehills and ant banks, and to keep sheep and up to two horses at a time, but no horned cattle. Mr Pyatt gave up the field on 29 September 1897. In fact he sold up completely on 18 August, the Catalogue for which shows 19 dairy cows, a two-year-old bull, two strong cart horses, two useful cobs, carts, Wagons, Implements, Dairy utensils and effects, a Rick of exceptionally prime Meadow Hay, an important Milk Round and about a hundred lots of household furniture. In February of 1.898, the Headmistress of the Bath College Junior and Preparatory School at 20 Portland Place wrote to Mr Stone that she had in her charge "fifteen tiny boys aged five and nine taught by Governesses". Anxious to find a field in which they can play during the summer she asks if there was any chance of hiring a portion of the field for this purpose. She had searched all round and can find no other level ground for these small boys. As an extra inducement for a favourable reply she adds that the grandson of Mr Henderson of No. 9 Royal Crescent attends her school. Records do not show the result of this plea. Perhaps is was positive, as in April of the same year Mr Henderson wrote that the boys had stopped playing in the lower field and thanks Mr Stone for mending the hedge. Our detailed records end here. There is only one more document dated 29 September 1905 recording an Agreement between am Charles Mercer Adam of 26 Royal. Crescent (Agent for the Owners and Occupiers of the houses in Royal Crescent ) and Robert Preston Jones of 6 Margaret Buildings, Butcher to let the pasture known a Royal Crescent Field lately in the occupation of Henry Gould at £18 per annum (this was increased to £30 in 1921). He was allowed to keep his mowing machine and tool houses on the premises and stack hay from the pasture only in the south west corner. Again he was only allowed to keep sheep and up to two horses at a time but no horned cattle. Original deeds to each of the 30 houses in the Royal Crescent contained a clause granting the owner and his successors "the free use of the whole area or space of void ground called or intended to be called the Royal Crescent in Common with other the owners and occupiers for the time being of the Houses building and to be built in the Royal Crescent". 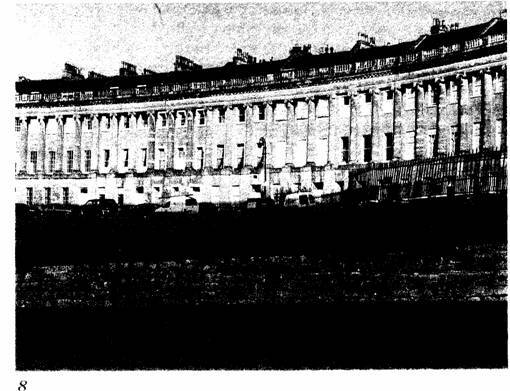 Another clause required that the owner and his successors "shall and will pay his and their proportional share in Common with other the owners and occupiers of Houses in the Royal Crescent of forming and bounding in with neat Iron Rails or pallisadoes the Grass plot intended to be in front of the said Crescent and of keeping the same in repair for ever afterwards". A common fund has existed for such a purpose in one form or another since at least 1825, from when the RCS holds records of a meeting at which Royal Crescent residents combined to pay for the installation of additional gas lamps. Other papers in its archive record the collection and expenditure of funds on behalf of residents, in the absence of a freehold owner of the Lawn, for the maintenance of the Lawn and surrounding railings and Ha-ha from 1830 onwards. These funds were augmented by the sale of hay from the Lawn cutting and the granting of grazing rights for horses. As owners and/or residents had been entitled by their title deeds to access to the Lawn since the completion of the Crescent in 1775, it is assumed that some arrangements for maintenance of the Lawn and its boundaries had been in place since then. At some point, not recorded, the tasks of collection of payments and administering the maintenance were passed to a firm of local Bath solicitors, now known as Thring Townsend, mainly on a goodwill basis. In the 20th Century the tasks were run almost single-handedly by a partner in the firm, Mr R. Forrester, who owned and lived in one of the Crescent houses, No. 25. The passage of time brought problems with further conversions of some of the houses into flats and the difficulties of keeping track of the ever-changing ownerships, as well as the lack of funds for legal action to enforce payments and the lack of any formal corporate structure to set funding levels. But enough residents continued to recognise their responsibilities to fund basic and acceptable standards of maintenance right through until the middle of the 20th Century. The Royal Crescent Society was formed in 1973, when concerned residents recognised the need to improve the appearance of the Lawn and its boundaries, which in the absence of an owner had been neglected for some time. The Officers of the RCS were then, as now, unpaid volunteers. Annual General Meetings and Committee meetings have been held continuously since 1974, and the RCS has undertaken the administration of the Lawn Fund, separately from its own funds, since that date. This has been used to fund cutting and general maintenance of the grass, litter collection, weeding etc., all sub-contracted to the Council's Parks Department, maintenance of gates and their locks, distribution of keys to residents, erection of notices, effecting insurance of Lawn, railings and Ha-ha, and arranging repairs when vehicles have breached the railings. Throughout this time, ownership of the Lawn was uncertain until the Society applied for title to the Lawn by the Land Registry by virtue of their stewardship over the years. The Land Registry agreed the claim in principle but advised that they could not grant title to the Society as an unincorporated association, so the CLC was created as a not-for-profit company in order to hold the title on behalf, not of the Society, but of Royal Crescent residents, and was granted absolute title in 2003. Its stated object is "to manage and maintain the Royal Crescent Lawn its boundary railings and bases and the Ha-ha wall structure for the benefit of the general public". The Company applied to register as a charity, on the grounds that it was preserving a vista for the benefit of the wider public, in order to make fund-raising easier for the major Railings and Ha-ha Restoration project and to take advantage of tax concessions. However this application was refused, and an appeal was unsuccessful. the CLC is a not-for-profit company. any resident is eligible to become a member by guaranteeing to pay £1 in the event of the Company's dissolution. the Articles do not allow the payment of any dividend to members. the Articles do not allow any director to receive financial or other benefit as a director. the Society will continue to guide the Company's actions. It is also proposed that the CLC should administer the Appeal Fund, since the Heritage Lottery Fund (HLF) insisted that it was the CLC, as an incorporated body and owner of the Lawn, rather than the Society which should be named as the partner with B&NES as recipient of the grant for the Restoration. It will therefore be the CLC which the HLF expects to pay the Crescent's share when the time comes. The Appeal Fund is kept in a separate account and it is not proposed to change that. If you saw the Olympic Torch being carried round the Royal Crescent you will have noticed the improvements which have recently been completed there. I have lived in Lansdown since 1976 and whilst working at The Royal Crescent Hotel the General Manager asked (in1991) if I would help the Royal Crescent (residents’) Society with the restoration of their ha-ha which runs between the lawn and the Royal Victoria Park. The answer was “Yes”. All Crescents in Bath have an open space in front of them – their “front garden” - and it is part of the residents’ legal responsibility to maintain them. Restoration work took place in accordance with English Heritage’s “as found” policy. Hence the ditch was gently re-profiled and the wall repaired and re-pointed. This was completed in December 2007. Next the corroded railings round the lawn were restored. Heavy road use by sight-seeing buses, etc, had spread the road surface to the extent that the railings were distorted by as much as 20cm(8 inches) in some places. English Heritage put them on their “At Risk” register. It was decided to re-use as much of the original ironwork as possible. Having established whether it was better to burn off the layers of paint or to sand-blast them with coke dust, work started and was completed by September 2009. In Victorian times they had been painted green, maroon and dark brown, but it was decided to paint the restored railings in a very dark grey. It had long been felt that a pennant stone path at the base of the railings would be an improvement on the tarmac. New stone was mined in Wales and shaped before delivery. B&NES (whose pavement it is) provided their paving contractors who have made a beautiful job of laying the stone, finishing in April 2012 – exactly 21 years since my first involvement with the project.